This golf stand bag is perfect for walking golfers. 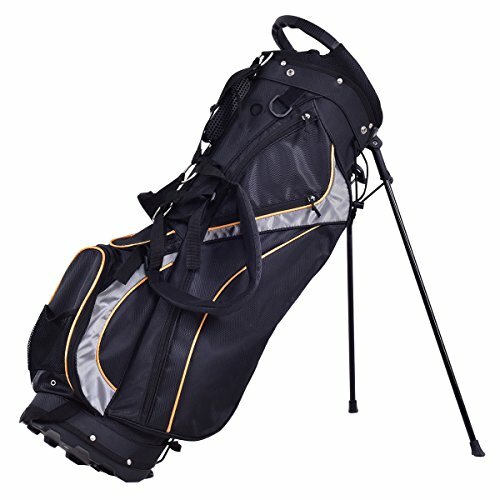 It comes with shoulder strap and full length dividers to protect your golf sticks. The bag is extremely lightweight and easy to carry while you are walking. It comes equipped with a durable stand that has angled feet and a stand lock strap. 7 total pockets offer plenty of storage pockets and convenient features making organization easy while the double strap provides extra comfort. Note: The Golf Sticks in The Pictures Are Not Included In The Package. Bag weighs approximately 5 lbs. Size Of Head Frame: 9" x 8"